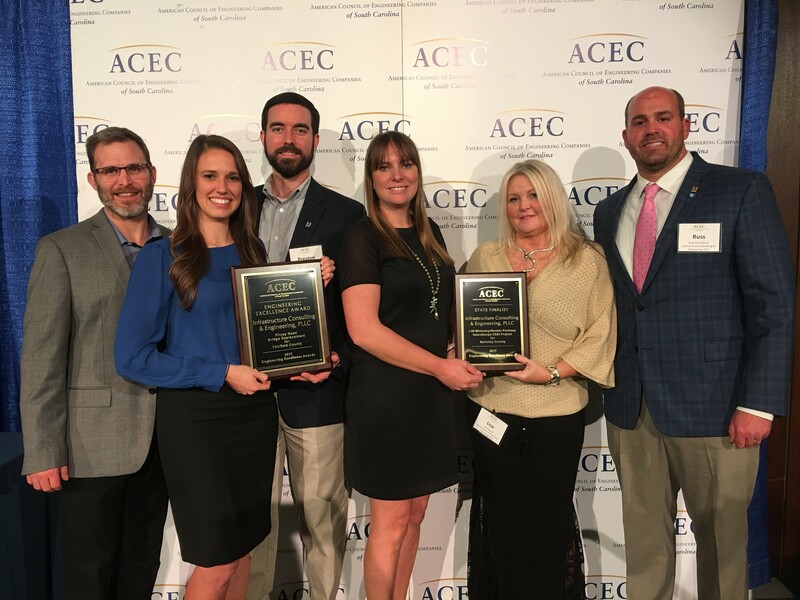 Infrastructure Consulting & Engineering (ICE) was recognized for engineering excellence at the American Council of Engineering Companies’ (ACEC) 2019 Engineering Excellence Awards Gala held February 5, 2019. Two awards were received in the categories of Special Projects and Small Projects; Fairfield County’s Finley Road Bridge Replacement project and Berkeley County’s I-26 Widening / Nexton Parkway Interchange Project. The Finley Road Bridge Replacement Project consisted of replacing the 20-year-old existing structure over a tributary to Big Cedar Creek which was originally built with a salvaged truck scale platform. The bridge was closed due to severe damage caused by the flooding events of October 2015. ICE served as the primary consultant for the overall design, project management, and successful delivery of the bridge replacement. The firm was responsible for bridge, roadway, and hydraulic design, utility coordination, geotechnical engineering, permitting, and construction, engineering, and inspection (CE&I) services. ICE delivered an efficient design while minimizing impacts to the surrounding environment and developed plans that resulted in an easily constructible, low-maintenance bridge for Fairfield County. The new I-26 Interchange / Nexton Parkway project is a crucial key in providing adequate infrastructure to support the regional growth demands in Berkeley County, SC. The work included construction of a new interchange at I-26 and Nexton Parkway; widening I-26 lanes for two miles; demolishing the existing Sheep Island Road Bridge; and constructing frontage road connectors and auxiliary lanes for connectivity to the local road network. Nexton Parkway is the new “Gateway to Summerville” with divided four-lane roadway, planted medians, and multi-use bike paths. The new roadway system totals a little over eight miles. As Berkeley County’s CE&I firm, ICE was responsible for the construction management and inspection services. Although several challenges were presented during construction, including three natural disasters and added scope items, the project was ultimately delivered on time and under budget, greatly benefiting the taxpayers and economic development interests in the area.